Typhoon Soudelor has been underdoing rapid growth and intensification during the last few days over the Western Pacific ocean. Winds of 170 kph (105 mph) were reported on Saipan as the eye of the storm passed over the island late Sunday night. The typhoon is currently heading west towards the southern tip of the large island nations Japan and Taiwan. There are tens of smaller populous islands in the wake of the storm. 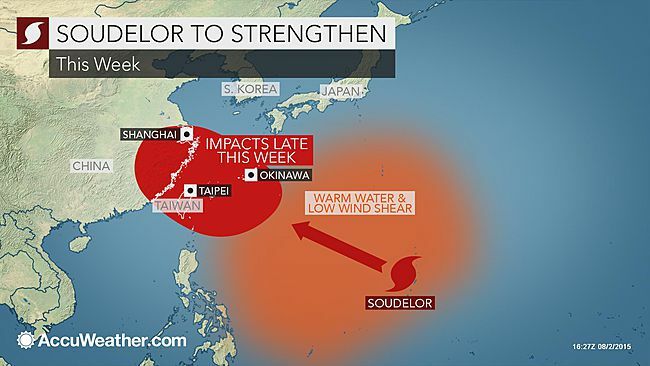 Soudelor will continue to strengthen while it crosses the northern Philippines Sea on its way towards eastern Asia. This year’s record-breaking North Pacific typhoon season has been strongly influenced by the strengthening El-Nino conditions.